Tomorrow, November 3rd, is Opening Day for the Saratoga Farmers’ Market winter season! 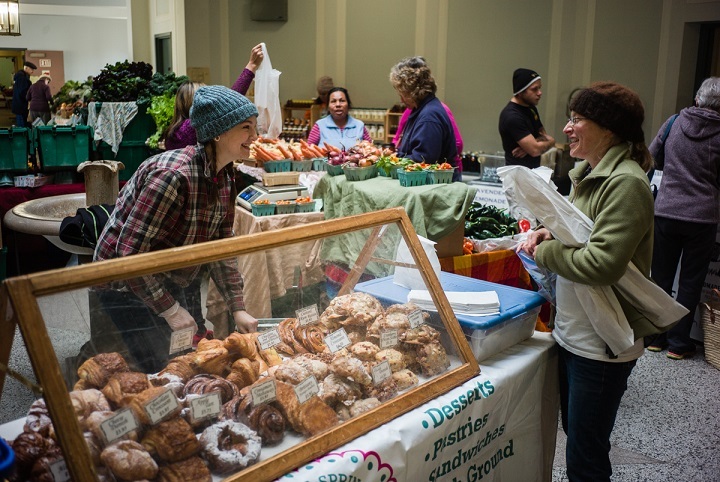 The market will be held from 9 am to 1 pm every Saturday, from now through the end of April, inside the Lincoln Baths building at 65 South Broadway in the Saratoga Spa State Park. Just before the 9 am opening bell tomorrow, Saratoga Mayor Meg Kelly, NYS Parks Assistant Regional Director David Barone, Saratoga Convention and Tourism Bureau president Darryl Leggieri, Spa State Park General Manager David Guest, and longtime local conservationist Barbara Glaser will share in a brief ribbon cutting ceremony to celebrate the start of the winter market season and the benefits of having the year-round Saratoga Farmers’ Market. Then, at 9 am, customers can head indoors to shop from over 40 farmers, specialty foods vendors and local artists, hear acoustic music, and enjoy the camaraderie of connecting with the community on Saturdays throughout the winter in a beautiful and fully accessible historic building. The musical guest for November 3rd will be an unplugged version of the ever popular Running the River band; information about additional upcoming Saturday musicians, sponsors of children’s activities, and other guests can be found on the calendar page of www.saratogafarmersmarket.org. Also on the website is a link to sign up for a weekly email newsletter, making it easy to find out about seasonal vendor offerings and special community events. The Saratoga Farmers’ Market has been in operation since 1978 with a commitment to providing local products from Saratoga county and surrounding Schenectady, Rensselaer, Washington and Warren counties. For the next six months on Saturdays at the Lincoln Baths, customers will find a wide variety of fresh, locally grown autumn and winter vegetables, fruit and mushrooms. Also available all winter season will be locally produced meat, fish, poultry, eggs, cheese, yogurt, milk, homemade baked goods, jams, wine, spirits, soap, and freshly prepared and ready-to-eat foods. New farms at this year’s winter market are Ramble Creek Farm, Squashville Farm, Green Jeans Market Farm, and Saratoga Urban Farm. In addition to farm products, the winter “Holiday Market,” offered every Saturday in November and December, provides unique hand-crafted clothing, jewelry, elegant glass art, gourmet dog food and treats, baby items, and other artisan goods perfect for gifts for everyone on a holiday list. As the Saratoga Farmers’ Market wraps up its outdoor season at High Rock Park this week with Customer Appreciation Day on Saturday, October 27 and Halloween festivities on Wednesday, October 31, vendors are gearing up for the indoor winter market at the historic Lincoln Baths at Saratoga Spa State Park. Moving into the Baths for the colder months means two floors full of a wide variety of nourishing foods from our local farms, dairies, bakers, distillers, and speciality foods producers, plus an array of unique hand-made jewelry, clothing, artworks, and other items made by area artisans. Acoustic music and free children’s activities round out the festive atmosphere, making the Farmers’ Market a perfect place to shop and connect with the community any Saturday of the year. The Lincoln Baths location offers ample parking, wheelchair accessibility, and a warm place for shopping no matter what the weather outside. Many vendors now take credit cards, and an ATM is on site for when cash is needed. Customers can also take advantage of the new FreshFoodNY App to order and pay online and have local products delivered curbside right in front of the Lincoln Baths! Every Saturday in November and December features our annual Holiday Market, a gathering of vendors who make a wide variety of items perfect for gift giving. Saratoga Farmers’ Market gift certificates are also available to help fit even the pickiest person on your holiday list. Customers can expect to find fresh late-season vegetables like cauliflower, Brussels sprouts, and many types of greens, plus hearty storage crops including squash, onions and all kinds of root vegetables, and even greenhouse and hydroponically grown tomatoes, cucumbers, peppers and herbs! Our agricultural products also include local milk, yogurt, cheeses, eggs, frozen chicken, beef, lamb, pork, goat, duck and turkey. In addition there are hot meals ready to eat for breakfast or lunch, and frozen soups, casseroles and other prepared dishes to take home for an easy meal anytime! Specialty foods at the indoor market this year include homemade jams, pickles, hummus, wheat grass juices, coffee, baked goods, meat jerky and other trail treats, and even puppy treats and vegetarian dog foods! Special events at the Saratoga Farmers’ Market are listed in the calendar section of our brand new website at saratogafarmersmarket.org. Sign up for the weekly email newsletter to get updates about special events, musical guests, vendor promotions, and all-ages activities and educational workshops. 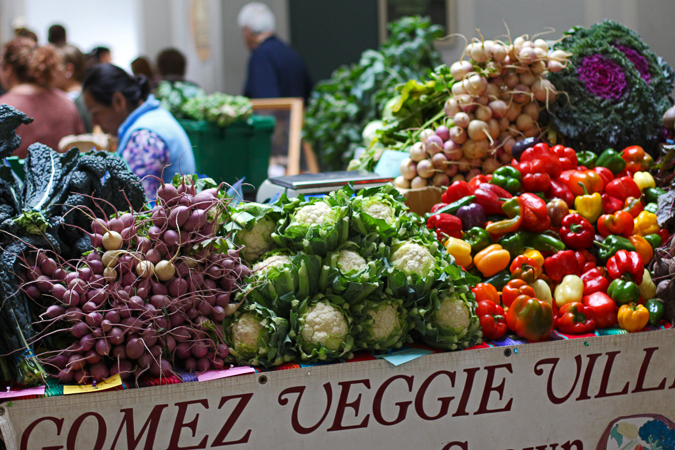 Come to the Saratoga Farmers’ Market on Saturdays November through April, from 9 am to 1 pm at the Lincoln Baths. Wash and core apples, leaving enough of the core at the base of the apple to contain the filling. Combine the butter, cinnamon, and chopped nuts in a small bowl. Roll log shapes of the mixture and press enough into each apple to fill the core. Fill a 2-quart baking dish with about 3/4 cup water, or enough to cover the bottom. Place the apples upright in the dish. 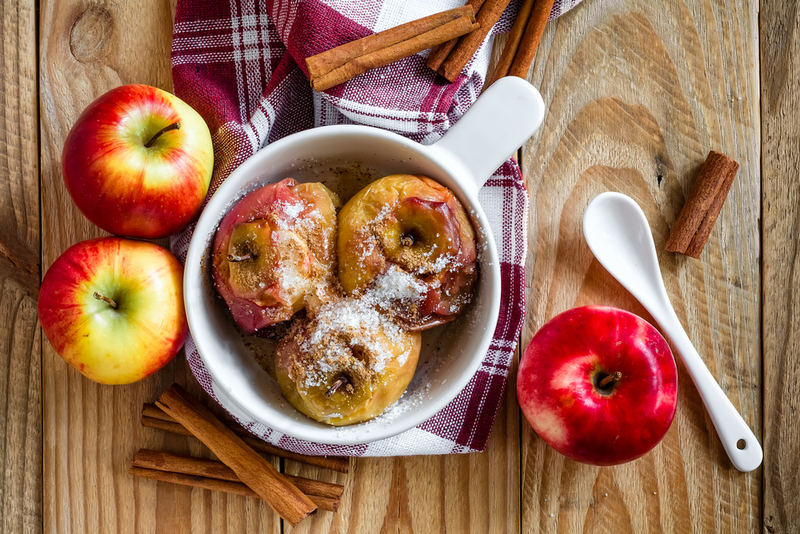 Bake until the apples are soft and the filling is browned, 1 hour. How can you use the foods grown and raised by local farmers at the coldest time of year to create meals that are healthy, warm, and pleasing to the palate? 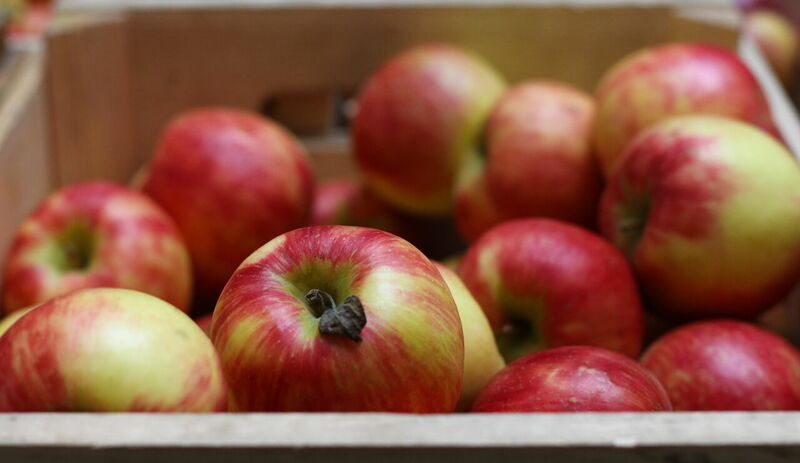 “Bake an apple,” recommends Christine Gaud, of Saratoga Apple. Gaud cuts out the core of an apple and fills it with a dab of butter and some nuts. She places the fruit in her wood-fired oven and lets it bake until it softens. “Sometimes, it takes 15 minutes, sometimes 20,” she says. You don’t need a wood-fired oven to do this. Following Gaud’s advice, I baked a Cortland apple at 350 degrees until it was soft to the touch. After it had cooled, I used a spoon to scoop out the inner flesh, which blended beautifully into a soft and silky custard-like concoction with the butter and chopped walnuts I added in. 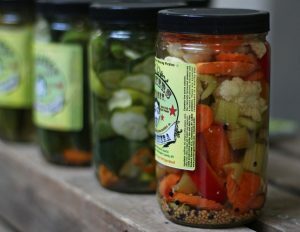 “Load up on probiotics,” suggests Kelley Hillis, of Puckers’ Gourmet Pickles. As she notes, probiotics – which are abundant in such foods as her naturally fermented pickled vegetables – help strengthen the immune system, which is vital to staying healthy through the winter. On top of that, the pickles taste tangy and crunchy. While pickles often are regarded as a condiment, Hillis suggests adding them to sandwiches, tacos, or salads or eating them as a vegetable side. “Many people have told me that they like to cut up my dill sours, for instance, and add them to a chicken or a tuna sandwich,” says Hillis. Frozen meats, aged cheeses, fresh fish, root vegetables, and greenhouse-grown salad greens, spinach and kale also are available at the Saratoga Farmers’ Market year round. 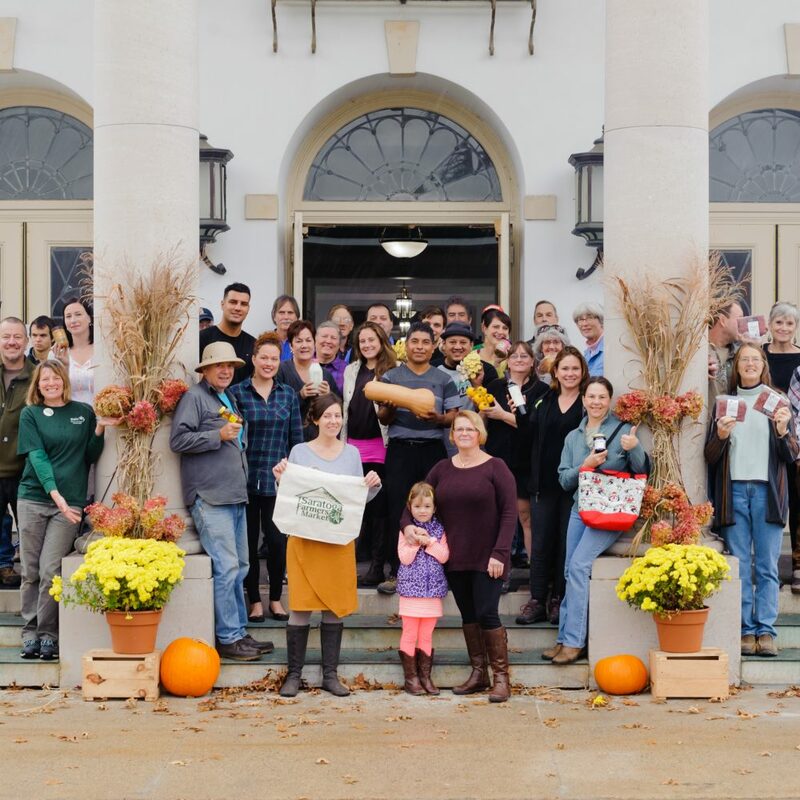 Visit the Saratoga Farmers’ Market 9 a.m.-1 p.m. Saturdays at the Lincoln Baths Building in Saratoga Spa State Park; follow us on Twitter, Facebook, and Instagram; and contact friends@saratogafarmersmarket.org for volunteer opportunities. Saratoga winters are harsh. It’s cold. The snow keeps coming. We can play in the fresh drifts and warm ourselves by the fire. But ultimately the taste buds start crying for something crunchy, tangy, and fresh. 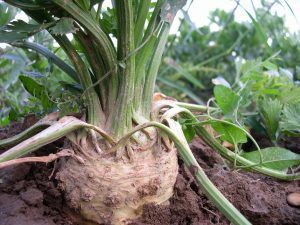 Celeriac might be the salve. 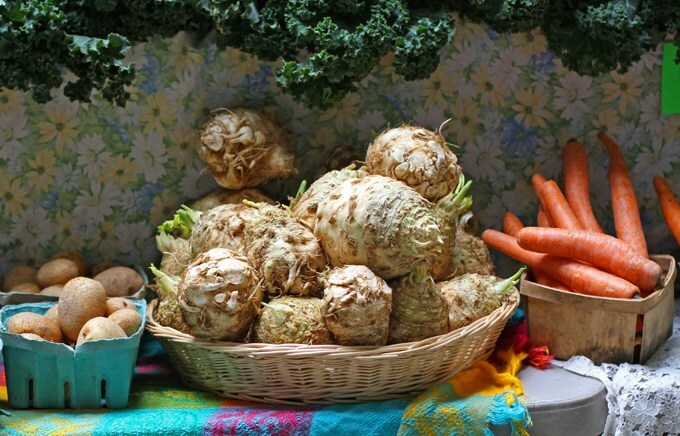 This beige, knobby root vegetable typically makes its appearance at the Saratoga Farmers’ Market just before Christmas. Currently, it is available from Gomez VeggieVille, whose members swear by the root. According to Valentina Gomez, it is celery with oomph. Her husband recommends peeling the outer surface, slicing into it thinly, and eating it as is or in a salad. She suggests steaming it, sautéing it, roasting it, or letting it steep into a root vegetable gratin or stew. “How you like celery is how to like celeriac,” says Valentina Gomez. 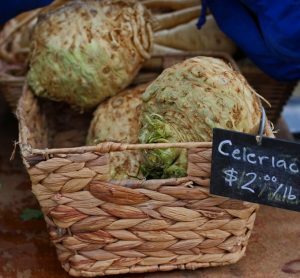 Over the years, I have bought celeriac from the Gomez’s and others. I have treated it more like an ingredient to add to a dish, rather than a dish in and of itself. It tasted to me like celery and maybe licorice. A little went a long way. began inundating me with recipes featuring celeriac: celeriac fries, mashed celeriac and potatoes, a gratin that includes celeriac. Market director Julia Howard also got on the celeriac beat. Garrett, Howard, and Gomez have emboldened me to experiment with celeriac. I have steamed it, roasted it, chopped it into salads, and eaten it as I like to eat celery – with peanut butter. Celeriac has proved its worth. Its flavor reminds me of seasons past and of the spring to come. It is crisp, tangy, and good.